This is a very unique car. It is one of the 9 Ford Talladega prototypes. These cars were built as Torino Cobras. This car was built without a data plate on the driver’s door. Most of the prototypes were not intended for delivery to the public. 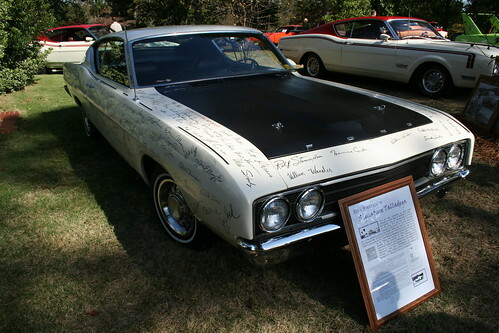 However, this one was given to NASCAR Bill France by Ford for use at Daytona Speed Weeks in 1969. 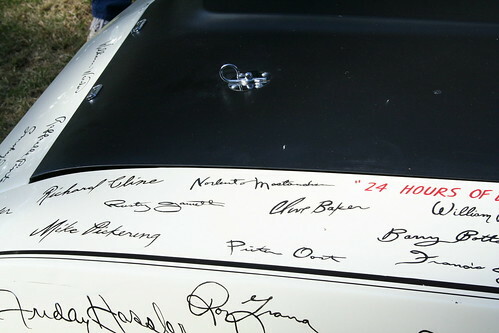 It was placed in the paddocks during Speed Weeks and all of the drivers from the Daytona 500, 24 Hours of Daytona and the Motorcycle races in 1969 signed the car! 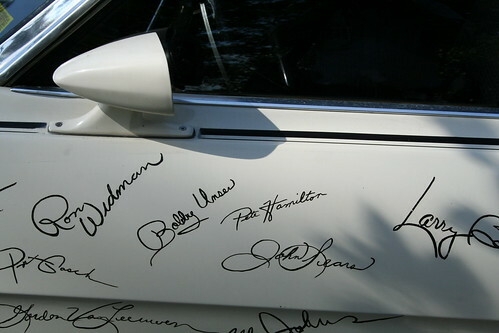 The car was titled in the name of International Speedway Corporation and driven by Mr. France and his son for many years. 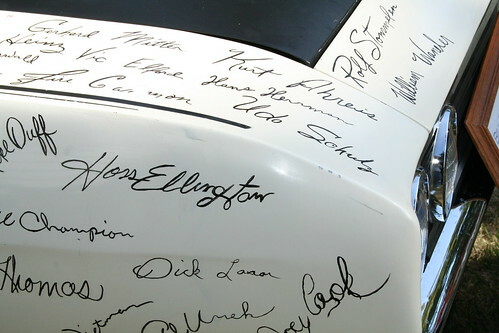 From there the car resided in the archives of the Talladega Motor Speedway Museum until 1999 when is was released for restoration. Special cars come with special stories. 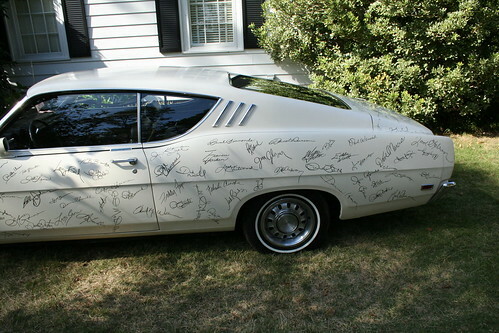 This car has more than one I am sure but here is one we know. 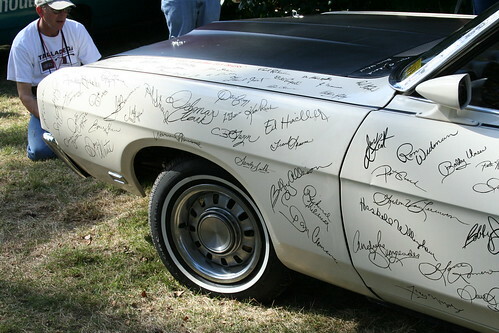 As noted earlier this is the car Ford gave to Bill France for display during Speed Weeks 1969 in Daytona Beach. 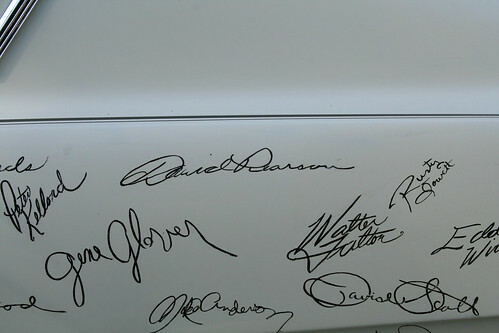 To make the car even more special France had every driver at Speed Weeks autograph it! You will find some very remarkable names on this machine. 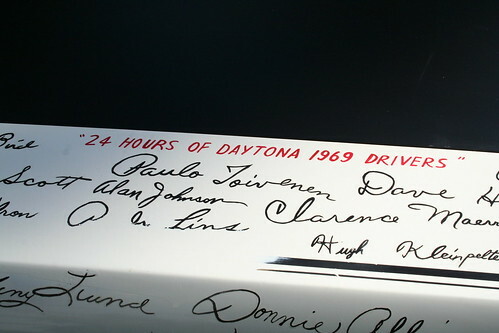 One that was placed there you won’t see is that of an exotic dancer in Daytona back in 1969. 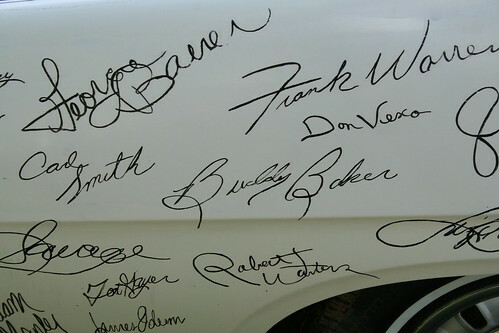 It seems automotive journalist Ken Squier was given the car to drive during his stay at Speed Weeks. As part of his rest and relaxation away from his duties at the Speedway this famed automotive journalist ventured off on a regular basis to visit a local bar that had some outstanding exotic dancers. Upon arriving at the Speedway early one morning following one such evening visit France Sr. confronted Squier and suggested he might want to wash his special Talladega prior to returning to the track. 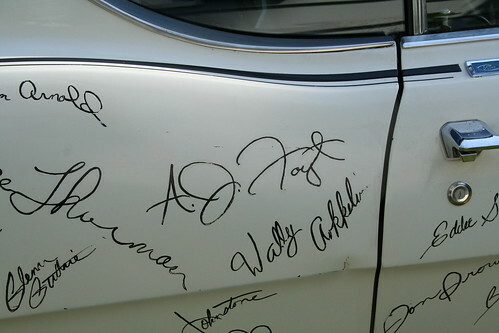 It seems that the night before one of Squier’s favorite exotic dancers had managed to autograph the passenger’s side of the very special Talladega in giant letters written in bright red lip stick! 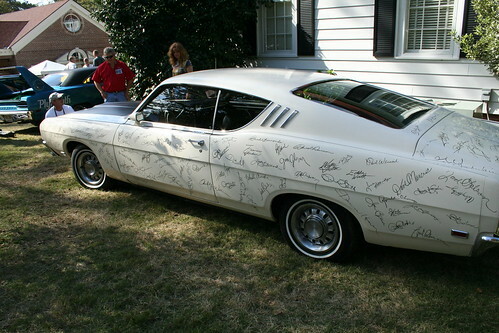 This car, minus the lipstick autograph, is owned by Mike Teske. 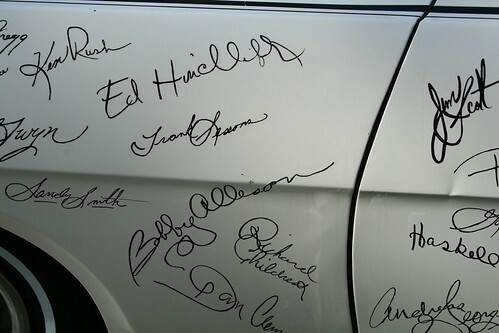 Here is NASCAR driver Bill Arnold pointing to his autograph signed on the rear quarter panel back in 1969 at Daytona Speedway! 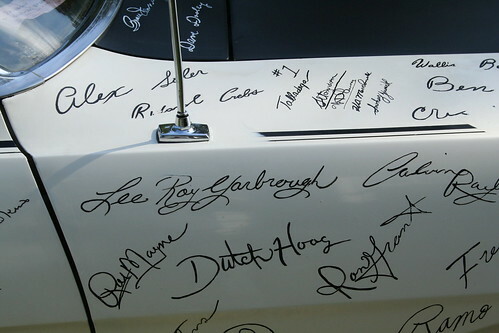 This picture was taken at the 40th reunion of the Aero Cars at the Wellborn Muscle Car Museum in 1969 just prior to visiting the Talladega Speedway.